In a continuing effort to ensure optimal and sustainable screening equipment processes and productivity, one Ohio company has recently expanded its advanced, full-scale screening test facility capabilities for customers free of charge. Comprised of over 10,000 sq.ft. of Midwestern Industries’ manufacturing headquarters in Massillon, Ohio, the Midwestern Materials Testing Lab is an invaluable testing facility platform – considered one of the best tools for customers to make informed decisions about their screening processes. Ultimately, end-users can use the facility to gain vital quantitative data into their screening processes via running ‘real-time’, full-scale material tests for new applications, as well as improving on existing ones. Midwestern is the industry’s only screening company to provide testing to this scale with production size equipment – at no charge other than the cost of sending in a 55-gallon drum of material to be test screened or separated. Once the material is tested, fast, reliable, and accurate results are provided to tell them which machine performs best and how efficiently it can run their material (i.e., tons per hour, etc.). Conclusively, this data provides vital screen processing insight to maximize bottom-line productivity. The driving goal of the Testing Lab is to facilitate uniquely sustainable screening material testing for a myriad of processing industries including: Pharmaceutical, Food & Beverage, Chemicals, Waste Water, Shot Peening, Plastics, Roofing Granules, Ceramics, and Powdered Metals, amongst others. A staff of Midwestern screening professionals work with clients to make sure the desired piece of equipment will do exactly what it is meant to do and accomplish their screening goals – thus taking the guess work out of it to ensure the quality of size and type of equipment before they buy it. Feasibility tests are done on all types of major machines (round, rectangular, etc.) by running samples of aggregates and fine powders from 20 microns and up. Product batches and super sack tests are also run to see if screening will make sense to meet the optimal standards set forth by the end-user. Midwestern professionals are available to go over the testing procedure and maintain constant contact with customers during the process – either on-site or via a GoPro video provided by Midwestern, along with a paper copy of sample test results. Midwestern also keeps an archived library of ‘blind/confidential’ test result video samples to streamline end-user education. Send in Material: Typically, a 55-gallon drum of material is recommended to be screened or separated. However, some tests can be run with a five-gallon bucket. Material must be sent prepaid. 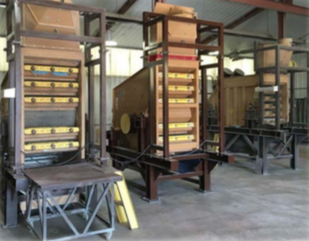 Run Test: Tests are conducted on both rectangular screeners and round separators with the ability to change screen sizes quickly and efficiently. End-users can be in attendance while the tests are being run, which will provide the opportunity to best understand the screener’s performance, as well as make adjustments quickly. Review the Test Data: Once the tests are completed, several result sheets are generated from the findings. Sieve analysis, rate sheet, and percentages of throughput, etc. are calculated and immediately made known to the end-user. A Midwestern’s sales professional will review the results in detail with them and then make equipment recommendations or other suggestions.